Ice cream sales may have cooled off in the past few years, but consumers are expected to be melting over the frozen treat once again. "I think we've reached the turning point where the industry is going to bounce back," said Andy Brennan, a market analyst for IBISWorld. "We're certainly forecasting a rebound." Trends toward healthier eating as well as the growing popularity of frozen yogurt trimmed revenue at ice cream store franchises by 4 percent to $3.2 billion from 2008-13, according to an IBISWorld report. "It's gone through a period of intense competition with frozen yogurt, which has grown at 20-30 percent per year," Brennan said. But the rebound is mostly benefiting mom-and-pops and small chains, rather than the big players of ice cream, as consumer tastes are shifting toward more premium products and local ingredients, as well as more customizable and portion-controlled options. "In some markets, such as urban markets like New York, Los Angeles, Chicago, etc., independents are definitely outgrowing the chains because consumers value that unique independent feel now, and it's a similar reason to why people value local ingredients," Brennan said. "They want some transparency to what they're eating, and you can't really achieve that with a generic chain brand. So independents and very small chains are doing very well in the urban markets." Inspired by comments on local business review site Yelp, Christian Tenorio headed to the Chinatown Ice Cream Factory in New York City Wednesday to get his ice cream fix. His ice cream flavors of choice: taro, a sweet root vegetable popular in Asian cuisine, and black sesame. "I've always been a fan of taro and black sesame," Tenorio said of his scoop preferences. "They're exotic." 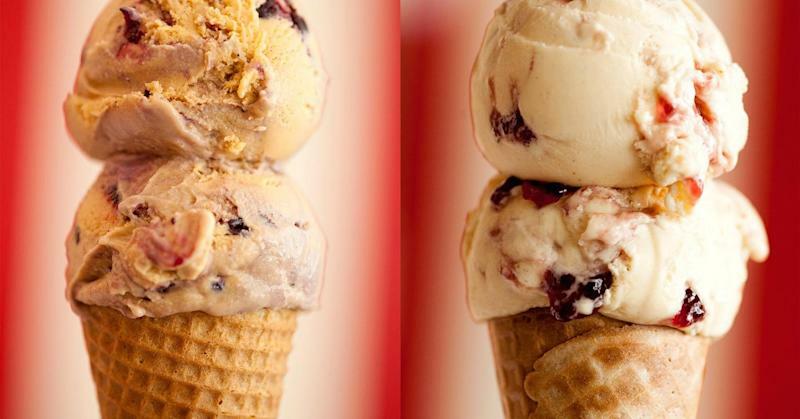 OddFellows Ice Cream in the Williamsburg section of Brooklyn, N.Y., opened last year and offers wildly unique flavors such as tobacco with huckleberries and smoked chilis, cornbread, and blueberry buttermilk honey. "This week we have caramelized onion with raisin caramel and walnuts. Last week we had foie gras. Some of the well-received ones were beet, goat cheese and candied pistachio and tobacco with huckleberry and chilis," said Sam Mason, OddFellows' ice cream man, who was the pastry chef at wd-50, the former Lower East Side landmark in modernist dining. "Within the first three months, I did over a hundred flavors, but I cut that out real quick. That was exhausting." Within 10 months of the company's start it had opened its second store in East Village, and that from its first to second summer, its sales have almost doubled, Mason said. OddFellows is even considering a move out to L.A. within the next year. But Mason said he remains skeptical about whether OddFellows' style would be well received outside urban markets. "This is that New York, and even more eccentric Brooklyn market. I think we're in a bit of a bubble," said Mason of the artisanal nature of his treats. "I've got an artisanal mayonnaise company as well. If that can work in Brooklyn, anything can work in Brooklyn." Small chain Amy's Ice Creams from Austin, Texas, is another example of the market shift working in favor of the littler guys. Since opening in 1984, the company has expanded to 15 stores, including locations in San Antonio and Houston. "We're an anomaly because we're multiunit but we're very mom-and-pop. We have a loyal customer base and are multigeneration. We haven't seen any contraction because we've stayed local and we've served multiple generations," said Amy's CEO Michael Hartman, who actually worked at Amy's in its early days while he studied at the University of Texas. Amy's draws customers with its customizable toppings and by tempering ice cream on a room-temperature board to get a fuller flavor profile. Servers also perform tricks as they scoop flavors that range from Mexican vanilla to pineapple coconut jalapeno. From 2008-13, combined revenue declines of the three major players in ice cream stores, Dairy Queen (BRK-A), Baskin-Robbins (DNKN) and Cold Stone Creamery, were faster than the overall category. Cold Stone revenue, the most dramatic of the three, fell 23.3 percent, according to IBISWorld. Now, however, they are showing signs of recovery. Brennan specifically cited Baskin Robbins' revenue growth of 1.9 percent from 2012 to 2013 as a sign of the future to come. Read More Can Buffett's Dairy Queen make it in Manhattan? "We are well-positioned to continue this growth, with investments being made both inside our shops to grow sales and outside our shops to create even stronger brand awareness," said Bill Mitchell, president of Baskin-Robbins US and Canada and Dunkin' Donuts/Baskin-Robbins China, Japan and Korea, in a statement. According to Mitchell, Baskin-Robbins took a number of steps to improve its business, including redesigning its restaurants and improving relationships with franchisees and offering new flavors and products. Meanwhile, Dairy Queen is also focused on new flavors and innovation, according to Barry Westrum, executive vice president of marketing for Dairy Queen. He cited the re-introduction of its popular S'mores Blizzard as an example of the steps it's taking. As for the threat of frozen yogurt, Westrum, in a statement, said, "At DQ, we've found that consumers see the two occasions (yogurt and ice cream) very differently. Ice cream is still the preferred option for a summertime, cool-down treat." Cold Stone officials weren't immediately available to comment. Others aren't sounding the full bells of recovery just yet. Harry Balzer, a chief industry analyst and vice president of the NPD Group who specializes in consumer eating habits, said he doesn't expect that the yogurt battle was the source of ice cream's pain. Instead, consumers are often shifting to healthier choices. "Back in 1989, the average American had 43 eatings over the year of ice cream at home and out away. They had three eatings of frozen yogurt. Today, ice cream amounts to 28 eatings, and frozen yogurt is one," Balzer said. -By Bo McMillan, special to CNBC.com.